Here it is Saturday evening, July 19, 2014. Bonnie, Rebecca and I sit in the living room of Bonnie and my Winona, MS home. We three went nearly two hours to Jackson, MS on this past Wednesday for pre-op preparation for Bonnie’s surgery on Thursday; we spent the night less than two miles from Baptist Health Systems in a hotel paid for with points from previous stays along our routes of travel for our appointments with congregations. Early Thursday morning, Bonnie underwent surgery once more; she’s getting pretty experienced at that sort of thing. 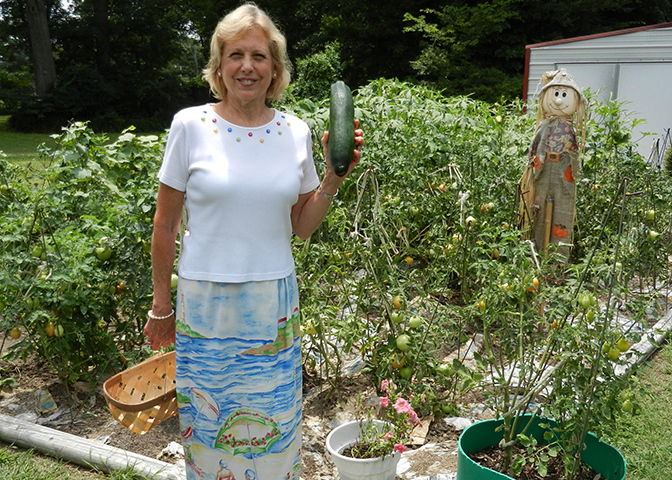 It was scheduled as outpatient surgery with an overnight stay in the offing nevertheless, depending upon the scope of surgery and how well Bonnie responded to surgery. We had plan “A” and plan “B.” Plan “A” was laparoscopic, whereas plan “B” was to reopen the previous surgery site if necessary. Despite the doctor having to proceed to plan “B,” Bonnie responded well and after surgery was almost given the bum’s rush out of the hospital – while she was still drowsy and barely able to stand; in all, within six hours we arrived, she had surgery and we were on our way back to Winona. For the balance of Friday, Bonnie remained sleepy and what little talk she attempted had all the words in the wrong order – and sometimes just the wrong words. Otherwise, Bonnie rested in the reclining loveseat, with me beside her. I worked on and completed the July issue of Gospel Gazette Online; I like the office chair at the house – reclining loveseat – better than my chair at my office down the street. Each day, Bonnie is improving more. She exchanged the chronic daily pain of a pinched intestine in the umbilical hernia for the temporary daily pain from the incisions – three of them. The doctor had to make two incisions in a failed attempt to do laparoscopic surgery before making a larger, third incision. We will venture out tomorrow to visit the Old Union Church of Christ for worship; we haven’t been there for so long, as we have been traveling elsewhere, that someone mused that perhaps the preacher had made us mad. Not so, of course. We have been the beneficiaries of the kindness of brethren, through text messages, phone calls and visits accompanied with prepared meals in hand. Though neither Bonnie nor I expected or even thought of someone bringing us food, we are thankful and have dined on those kindnesses. Rebecca returns home Tuesday in preparation for her mission trip to Guyana, South America later in the week. She has been a great help and encouragement to us, particularly in this difficult time for Bonnie and me. In her weakened and physically compromised condition, more of Bonnie’s domestic duties are now my opportunities; we have always shared each other’s responsibilities, but now I just get to share more. Soon, Bonnie will be able to resume some of those activities, but some activities at the house and at the warehouse/office she will need to relinquish permanently. Bonnie and I will try to conclude plans for our fall trip to Asia – Myanmar and India, perhaps Singapore, too. One of the decisions we will need to make, depending on how well and how quickly Bonnie mends, is if she is going to accompany me this fall and share in the workload. I am already close to being unable to manage my own carryon bag and computer up and down airplane steps on the tarmac, and Bonnie will not be able to carry either her carryon bag or her computer. 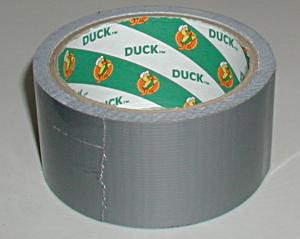 We are getting older, and we may be held together with Duck Tape, Super Glue and baling wire, but we press on. We covet your prayers. Last night, we got to Rebecca’s home from the Memphis airport around 11 p.m. The rain poured from the blackened night sky and flooded the roadways, making for slow going and extreme difficulty spying out the highway striping to not only identify the respective lanes but the road itself. The brunt of the storm had preceded our arrival, and it had battered and broken numerous trees in Rebecca’s neighborhood. Fortunately though, her home was not one of the thousands without electrical power due to the storm. Bonnie and I turned in for the night around 1 a.m.
We three loaded the van once more and headed out, ultimately bound for Winona, MS. First, however, we took breakfast at Cracker Barrel. We still showed up nearly half an hour early for our 9 a.m. appointment with SpeedPro Graphics. 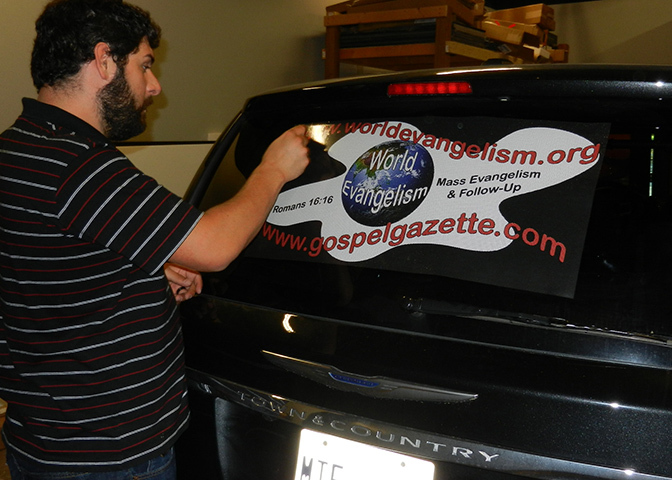 In less than an hour, we had three vinyl signs installed on the new van. We retired our former van after 10 years of service, but the more recent minivan lasted but seven years before we thought it best to retire it. Presently, it sits by our mailbox with a “For Sale” sign offering it to passersby. 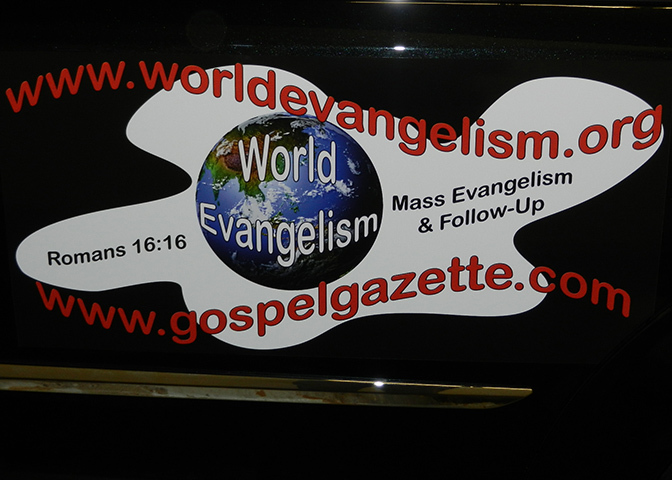 Since we have a new vehicle with many years ahead in service (Lord willing) respecting our labors for Christ, I opted to have it advertise the webpages for World Evangelism and Gospel Gazette Online. Anyone following those Internet links will find a wealth of information, especially in the thousands of studious articles found within the pages of Gospel Gazette Online. The phrase “Mass Evangelism & Follow-Up” provides a brief definition for World Evangelism, and the reference to “Romans 16:16” may signal to members of the churches of Christ that we are members of the Lord’s church – almost a secretive code. At any rate, we cannot afford to put everything on the side of the car. Back in Winona, we returned to the office. Tomorrow, we will head to Jackson, MS for Bonnie’s pre-operation preparation for surgery on Thursday. Bonnie is scheduled to be hospitalized overnight, but the extent of surgery needed, etc. will determine how quickly we return home; we expect to return to Winona on Friday. Bonnie and I are both anxious for correction of her umbilical hernia that brings her daily pain presently. Her light to medium duty afterward will probably be lifelong, considering this upcoming surgery as well as the previous Whipple Surgery for pancreatic cancer. Otherwise, Bonnie is cancer free, and though slowed a bit and tired frequently, she and I press ahead. Thank you for your interest and prayers on especially her behalf. 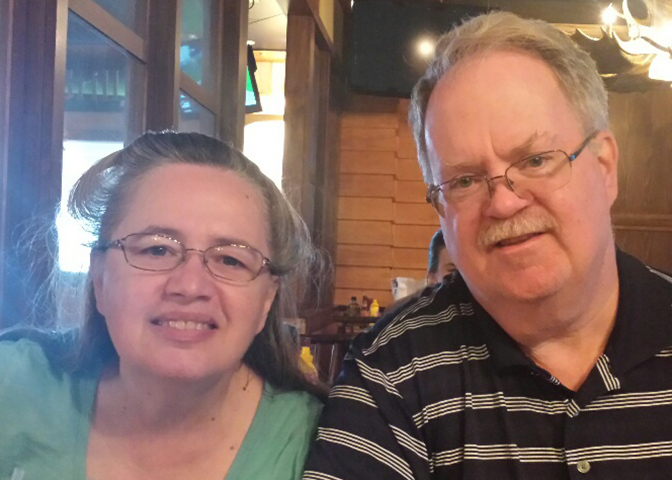 Sunday, July 13 was a little more relaxed for we three (Bonnie, Rebecca and me), and it was a good buffer between the vacation venues of the preceding days and Monday’s daylong travel toward our homes in Tennessee and Mississippi. Of course, the highlight of every first day of the week is the opportunity afforded God’s people of worshipping Him “in spirit and in truth” (John 4:24). This we did, as we had the prior Wednesday evening upon our arrival in South Dakota, with the Rapid City Church of Christ. Truly, we found these brethren on the Internet through the church’s webpage. Two other congregations vied for visitors through their websites as well, but each of the three sufficiently identified themselves whereby we are able to find those of “like precious faith” (2 Peter 1:1). We always opt for biblical balance over extremes either to the left or to the right. We felt like we had always known the saints of the Rapid City Church of Christ. The worship was reverential, and there were neither surprises nor disappointments. One ought to fairly well know what to anticipate even when meeting with faithful Christians in an assembly not previously visited. I heartily recommend the Rapid City Church of Christ to Christians who may visit the area. It was also my good pleasure to speak to the congregation Sunday evening; I always feel more comfortable on the speaking side of the lectern than seated on the other side – because I want to serve to the fullest at every opportunity as long as I live. Given a choice between a biblical lesson and a PowerPoint presentation about our mission work, the eldership opted for the latter. I showed pictures and narrated them respecting our month-long mission trip in February of this year. We were very well received, and we certainly have made some new friends. Bonnie, Rebecca and I were lunch guests of the preacher and his wife (brother and sister Chuck Taylor). He is facing some serious health problems, which to the best of his ability in the near future as well as for the balance of his life he hardly allows it to detour him in the least from serving our Lord Jesus Christ. He is a writer, too, whose articles I hope to introduce shortly to The Voice of Truth International and Gospel Gazette Online. Monday has been a long, leisurely travel day from Rapid City Regional Airport to Minneapolis/St. Paul to Memphis, TN. This is also Bonnie and my anniversary (#41), and we are spending it together in airports and on airplanes; Rebecca is with us. We had a very delicious lunch meal at the Northern Lights Grill; Bonnie and I shared perhaps the best pot-roast plate we have ever had, and the portions were gigantic. Rebecca had a similar meal in sandwich form, piled HIGH! As I write this, we are in the Minneapolis/St. Paul Airport at our Gate, which we will board in just a little while; because Delta cancelled one of our flights, we have an extended layover here of FIVE HOURS! We are vacationing at the airport, too! It’s all good. We should arrive at Rebecca’s home before 10 p.m., we think. The protracted layover has afforded me some valuable time to work on the July issue of Gospel Gazette Online. Among other things, we certainly are not rushed-more. Saturday, July 12, 2014, Bonnie, Rebecca and I headed for the South Dakota Badlands. No, we were not on the lam as outlaws seeking some hole in the wall from which we could hide from a pursuing posse. We were merely day visitors, along with perhaps hundreds of others who ventured into the federal park for an outing or as workers. However, we did spy some regular residents inside or just outside of the reserve – mountain goats and prairie dogs. On the way to the Badlands, we paused at Wall, SD for the purpose of moseying through the famous Wall Drug complex. It so happened that we arrived just in time for a small town parade – the smallest and most locally spun we’ve ever experienced – all of one block long! Wall Drug itself is one block long and two blocks deep – packed with tourist-trap merchandise, fine art, food, and various curious amusements for young and old. It is a destination all its own. Remarkably, though, we didn’t buy anything. Before leaving we did the once over of the Wounded Knee Museum gift store and Native America crafts as well as a nearby novelty and touristy shop. Like yesterday, today, we made a giant circle in the process of following the scenic drive through the Badlands National Park. The topography over which and through which we traveled varied from Great Plains prairies to irregularly eroded, layered, jagged mountains. The mountains through which we traveled the past few days were completely different in every way from these; today’s mountains seem atypical to mountains generally. Bonnie, Rebecca and I enjoyed a picnic lunch at a shaded park table. The nearly treeless landscape afforded us no respite from the abusive sunlight beating down upon us, although the temperature was moderate at 78 degrees. Nevertheless, repeatedly, we parked the car and strolled along walkways before getting back in the car and driving to the next viewpoint. It was another good day on God’s marvelous earth. Moreover, I spent it with my two best friends – my wife of four+ decades and our oldest child. Bonnie, Rebecca and I launched out from Keystone, South Dakota on Friday, July 11, 2014 to make one humongous, all day in the making, circle through the Black Hills. First, we drove the two miles from our hotel to the Mt. Rushmore National Memorial. We snapped some more pictures of the colossal monument in a different light from the day before. In addition, we toured the museum, which was underneath the balcony seating where we sat the night before. Incidentally, we were rewarded later in the day with bonus pictures of Mt. 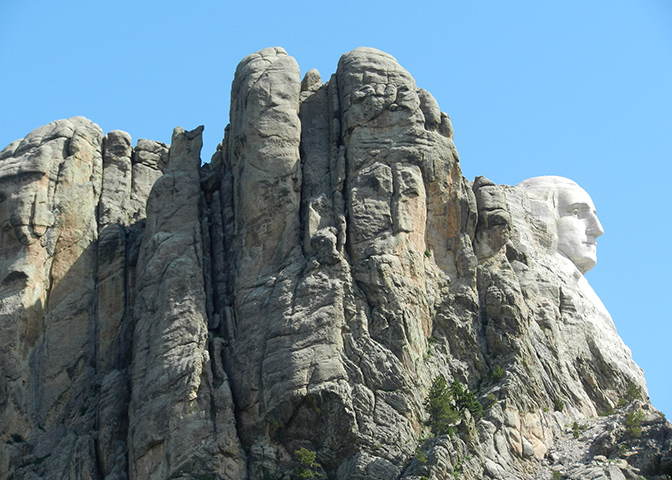 Rushmore from highways near and far. 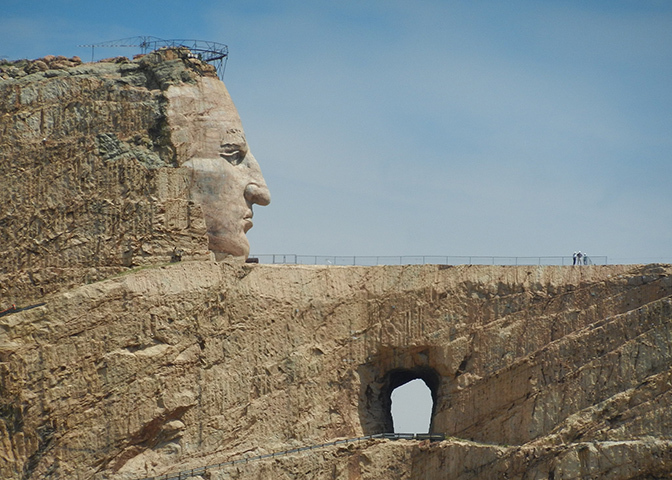 Our next destination was the Crazy Horse Memorial. There was a thoroughly engaging Native American exhibit that filled a small campus, besides the monument under construction in the near background. There was a very accommodating restaurant on the premises in view of the ongoing work on the tribute to American Indians; we three enjoyed a relaxing and satisfying lunch. For the balance of the day, we drove and we drove. We disembarked from the rental car time and time again to see spectacular views and to chronicle some of them with our digital cameras. 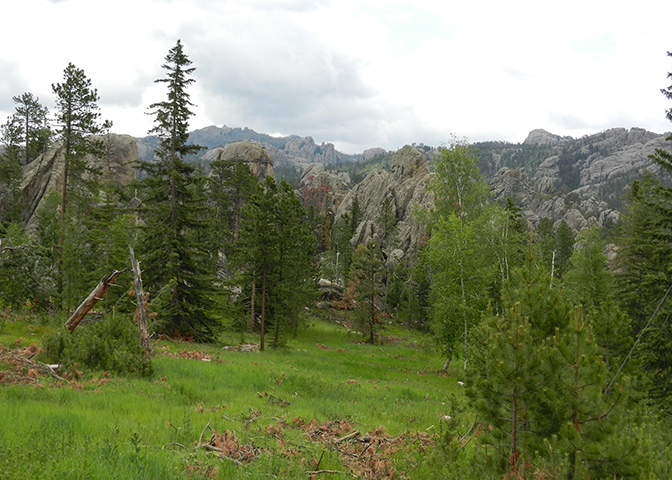 We drove through the Black Hills in general and through Custer State Park in particular. 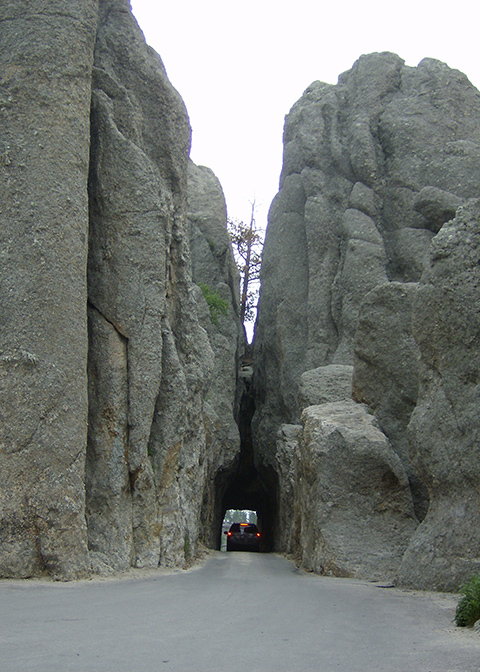 We climbed mountains on roads terraced in series of U-turns; we squeezed through barely one-lane tunnels; we spiraled through highway pigtails twice to descend rapidly down the mountainside; and we observed all manner of terrain from rolling high plains to needled rock spires projecting into the South Dakota sky to massive, jagged mountain rock faces. 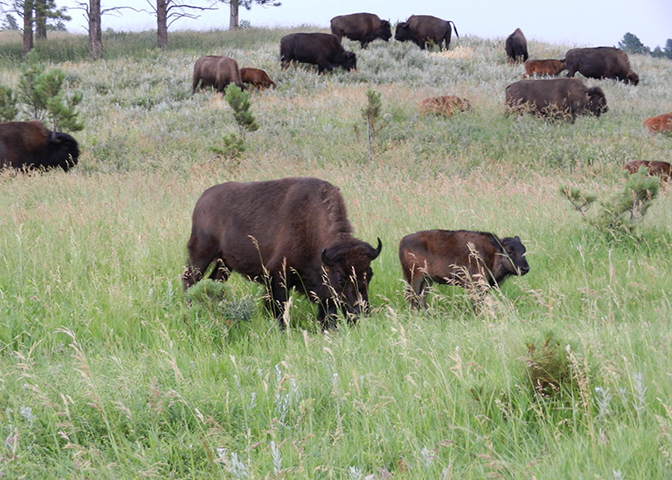 It was with delight that we began to enumerate the various wild creatures that we spied along the way: red squirrels, chipmunks, wild burrows, pronghorns (antelope), deer, beaver, and with great enchantment herds of buffalo. They crossed the road, piercing traffic approaching from both directions – bringing it to a halt while the passengers in the vehicles were mesmerized by the uncommon critters. The day was one well worth the time spent as we enjoyed one another’s company, shared these experiences and were awed by God’s creation – both planet and beasts. We have zillions of pictures to document the adventure this day has brought our way. Tomorrow our destination is the Badlands. Stay tuned! I did manage to part with a few dollars before boarding our train to yesterday – running between Keystone and Hill City and back. We bought some commemorative magnets and some Mt. Rushmore hats; Rebecca bought some books. 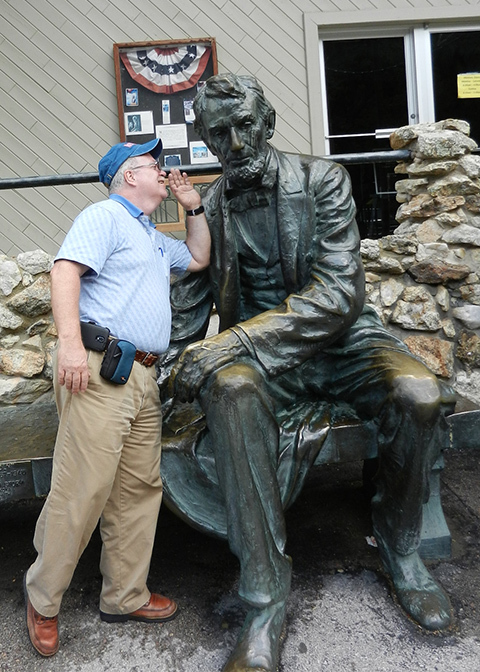 I whispered some advice to Abe. Between Rebecca and us, we snapped 219 photos, mostly along our train ride. However, we went to Mt. Rushmore in the evening to take some pics of the national monument with night lighting; in the morning, we will return to Mt. 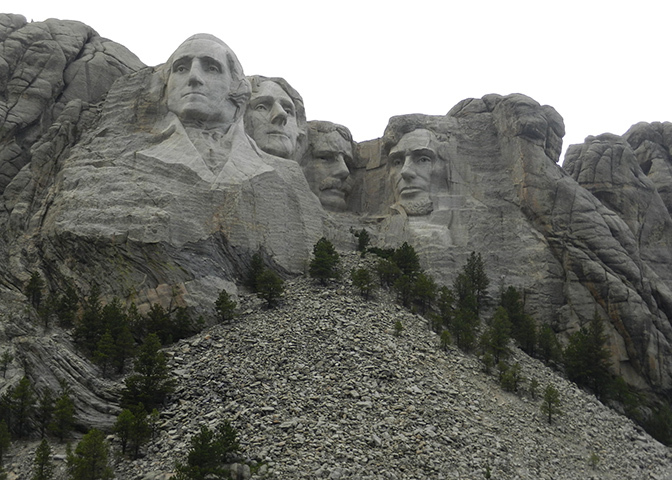 Rushmore for a more extensive tour and daylight pictures.